The Fellowes® Professional Series™ Back Support supports your back with a 2-tiered system. Features a mid-spinal support with memory foam cushion to promote good posture, and a lower lumbar support with three memory foam sections that conforms comfortably to natural body curvature. Innovative Tri-Tachment™ system eliminates the need for readjustment. Memory foam self-adjusts for custom support, and is made of a soft, breathable fabric for a relaxed fit. To set-up, place the support on your chair, position yourself comfortably, and clip the straps in place. Fully adjustable design fits most office chairs. Supports your back with a 2-tiered system. 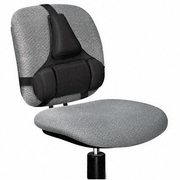 With mid-spinal support with memory foam cushion and a lower lumbar support with three memory foam sections. Innovative Tri-Tachment™ system eliminates the need for readjustment. International Academy of Ergonomics certification pending.